At the forefront of engaging grand format visual solutions, Super Color Digital is growing and creating new solutions that are ideal for every industry. One specific capability that is used around all industries is window graphics. Window graphics are designed to be visually impactful while blocking out unnecessary light and providing privacy. Super Color Digital is taking window graphics to the next level and are proud to introduce our exclusive double-sided block-out mounting film. 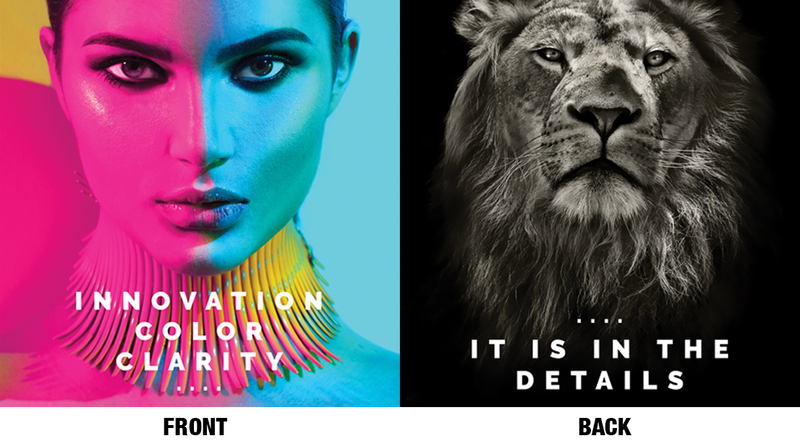 This new material provides a vivid color output, front and back while creating 100% block-out between the front and back image. This eliminates image or text see-thru “ghosting” from the front to back image. Designed with versatility in mind, our double-sided material is water and tear resistant while being eco-friendly. Best of all, we have made sure to alleviate your stress and save time, as the block-out film is very easy to install and remove. Ideal for storefronts, restaurants, retail spaces, events, and more, our exclusive double-sided block-out film is a perfect solution. Innovation. Color. Clarity. It Is In The Details. Contact Super Color Digital today and see how our new double-sided block-out film will benefit you and your future projects.